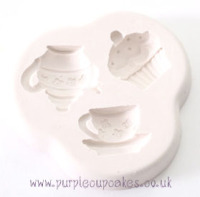 Squires Kitchen Mould - Buttons in various shapes and sizes for use with sugarpaste and florist paste. Simply press your chosen medium into the silicone mould then flex to release a perfectly formed shape time after time. Fit for a King or Queen - or the Queen's Golden Jubillee Celebrations!